I bought a Coleman 16-quart wheeled cooler and this seat wedge cup holder that is designed to be wedged in-between automobile seats. It is perfect for my application because one side of it is flat so it can be surface-mounted. I drilled two holes through the cup holder and front of the cooler and used stainless steel screws and metal-backed neoprene self-sealing washers (say that 10 times real fast) on the inside of the cooler to keep water from leaking out and secured them with stainless steel nylon locking nuts on the outside. 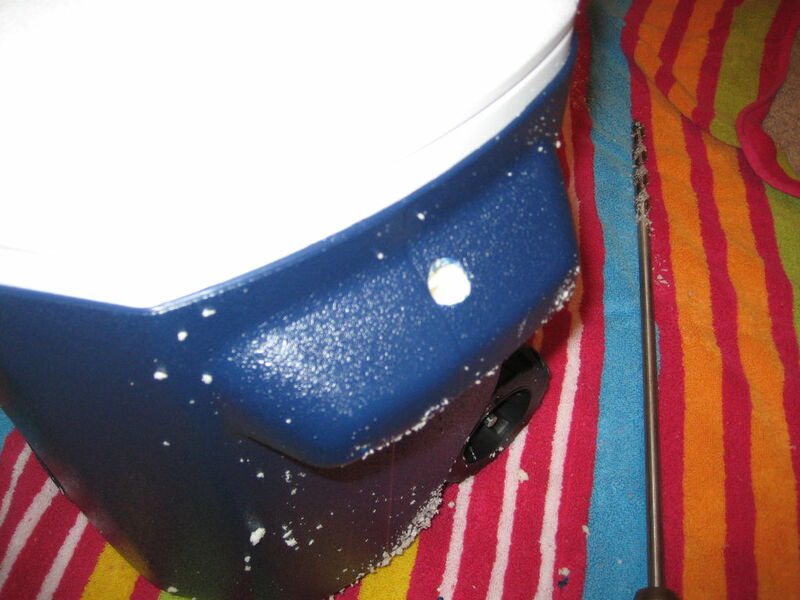 Pop-rivets may have worked just as well but I was wary they could pull out of the soft plastic outer wall of the cooler if the cup holder was banged hard against something while transporting or pulling the cooler. Although this particular model cooler gets 5-star reviews on Amazon, the major knock against it is the lack of a proper handle to lift it out of a car or carrying it up steps or across rough terrain. The handles on the sides are where the insulation was injected into the cooler during manufacturing so there isn't a good recess underneath to get a good grip so they are quite slippery. I decided to add a rope handle. I drilled a hole down through each of the bulbous "handles" and pulled a piece of poly rope through the holes and knotted the ends. If you do this then push the rope through the top hole with a screwdriver then use needle-nose pliers to reach up through the bottom hole and pull the rope through. Make sure you use a lighter to melt the ends of the poly rope so it doesn't unravel. I experimented briefly with slipping a neoprene cane grip over the rope for a handle but it was much more comfortable carrying using just the rope alone. I had been using iMain Go 2 speakers with my old iPhone to supply the tunes for me and my wife at the beach but since I now have a much larger Samsung Galaxy Note 2 that won't fit inside the zippered speaker case, I decided to upgrade to a Grace Digital ECOROX waterproof, bluetooth speaker. It is very small and portable and is just the right size for me and my wife at the beach. It has play/pause, track and volume controls right on the speaker so once you start the music you can put your phone away. Another reason I chose it is that it has a standard camera-style screw mount. I bought this Minoura Handlebar Camera Mount (22-29mm) so I could clamp the speaker to our beach chair or umbrella pole but also decided to try it on the cooler handle. The handle was a little too skinny so I bought a neoprene replacement cane grip at my local Kroger pharmacy and unscrewed the plastic handle from the cooler and slipped the neoprene grip over it. Now the ECOROX clamps securely to the cooler's handle. An added bonus is that after our trip I can clamp the speaker to my bicycle's handlebars or even use it in the shower since it is waterproof. One final step was to drill a drainage hole into the bottom of each cup holder. Remember this automobile seat wedge cup holder is designed to be easily removed from a car and turned over to empty it but if it is not removable as in the this case then condensation would fill them up and you would have to turn the entire cooler over to empty them. The cup holder sits slightly tilting forward so I drilled the holes toward the front. I guess I always loved Rodney Dangerfield's fully accessorized golf bag from Caddyshack so this project is in its own small way a tribute to him...a fully accessorized mini-cooler! where did you get the cup holder and how much?